SANTA MONICA, CA — Walking around Santa Monica’s Third Street Promenade, visitors have come to love all of its classic sights and sounds: the lines of trendy shops, the ivy-lined dinosaurs gushing water into crystal-clear fountains, the street performers dancing and singing their way to a meal ticket, the beautiful Southern California Beach just steps away. 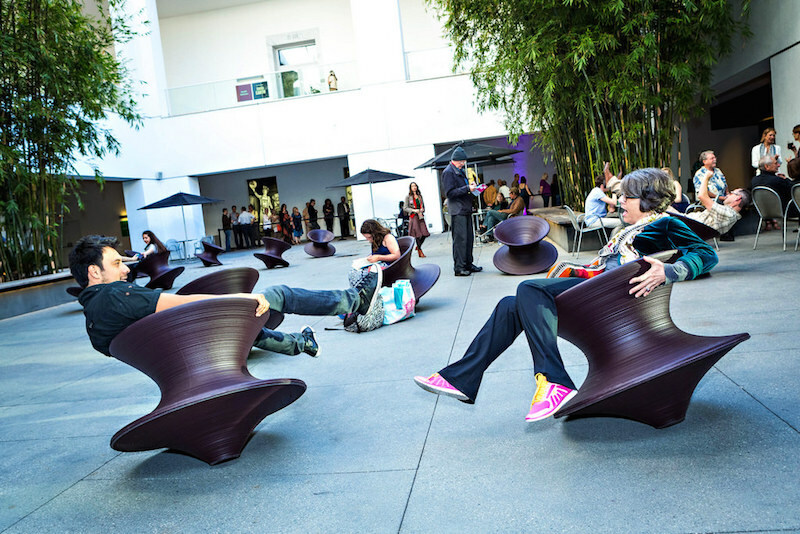 What has really made Third Street Promenade such a lasting attraction in a city where trends come and go, however, is the dynamic nature of the events coming in and out that add to the already dizzying array of life. 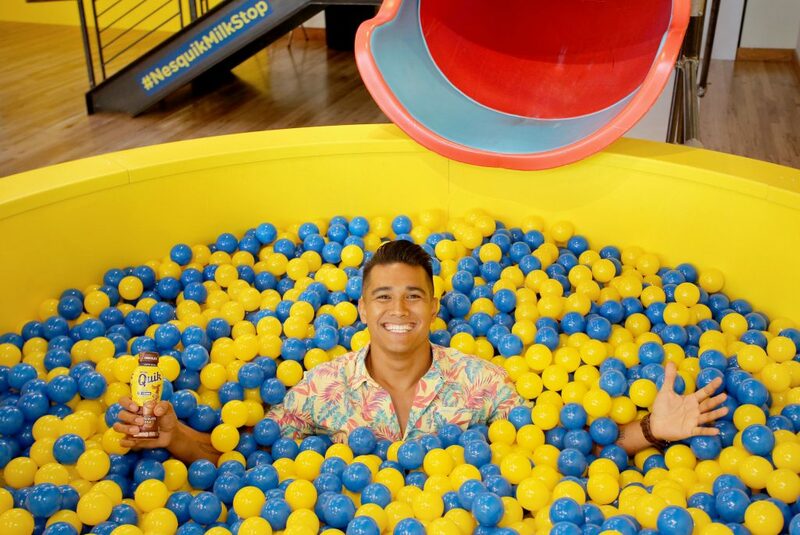 In fact, it is this balance of comfort and excitement that exactly highlights the spirit of Nestle’s Nesquik, which is hosting a week-long pop-up event in the popular locale. But why Nesquik? 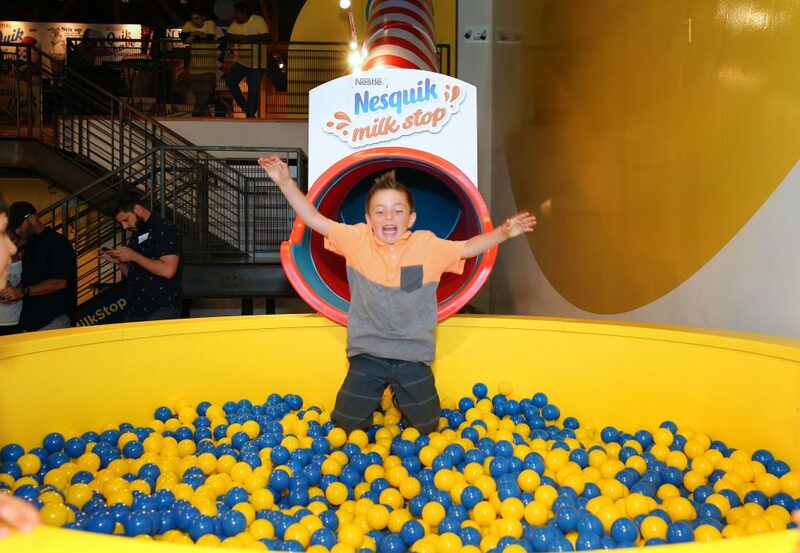 Even though deliciousness is, to be honest, a perfectly valid reason to celebrate, Nestlé brought this pop-up shop to LA to celebrate Nesquik being around for 70 years—enough for kids and their parents and their parent’s parents to remember, which makes stopping by the event an easy crowd-pleaser. 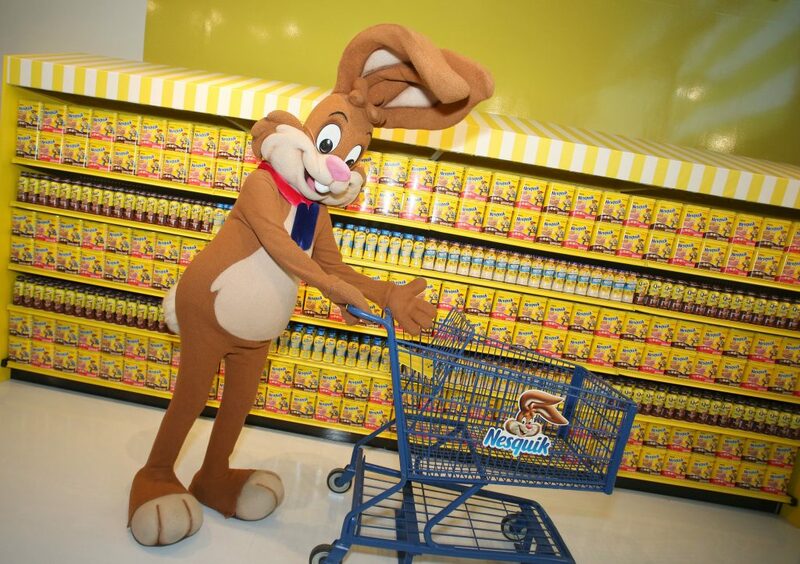 Any true promotional event is nothing without the chance to try out the product, and fortunately, Nesquik totally gets this, as plenty of samples of drinks both new and familiar will be on hand to try. The samples are actually pretty interesting—Cooking Channel’s Jordan Andino, who has two restaurants in New York, has been on Food Network’s Chopped and Beat Bobby Flay, and hosts his own show called Late Nite Eats—came up with a banana and raspberry smoothie as well as a very creative candied bacon milkshake. For Andino, Nesquik hits home—he’s been drinking it as far back to his toddler days through way of it being mixed into his champurrado back in the Philippines, where he spent some of his formative years. 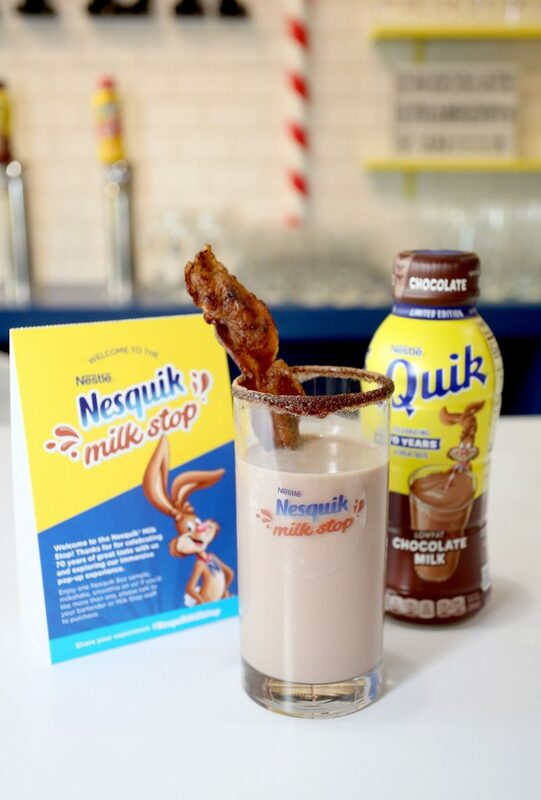 A self-described “legit fan” of Nesquik, Andino— whose typical uniform out of the kitchen is a Hawaiian short sleeve, jeans, and a bright white smile—explained further his Nesquik banana and raspberry smoothie and candied bacon milkshake. 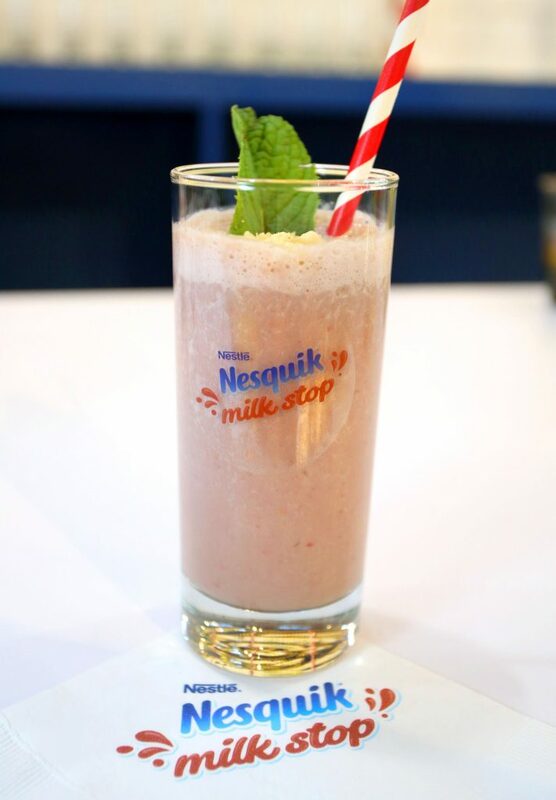 “I wanted to make two recipes: one that was decadent and sweet, and another one that aligned with Nesquik’s movement towards healthier options,” Andino explained, adding that the banana and raspberry smoothie also has pureed mint and fried banana chips for texture and that the candied bacon milkshake actually has candied bacon pureed in with a salted Nesquik rim. In addition to trying out Nesquik drinks, the Milk Stop has a bunch of immersive photo opportunities and experiences, which are summarized below. A literal grocery aisle photo wall filled with Nesquik products! A raining milk backdrop complete with an umbrella! All in all, Nestlé and Nesquik have made a really fun and aesthetic spot at the entirely right price of completely free. 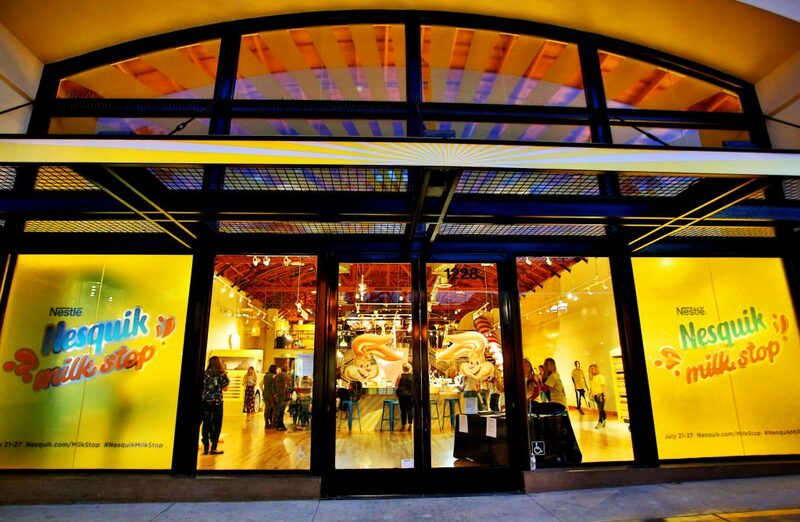 For an ideal day, we recommend walking around Third Street Promenade, doing some shopping, stopping by the Milk Stop to refresh yourself and get some pics, and then finishing it all off with a walk on the beach to the sunset. For just a week, this fantasy can actually be your reality.